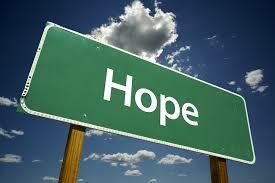 If there is one word to sum up what is lacking in this world of ours my guess is it would be “hope”. For those who have not come into a personal relationship with Christ there is not much to be hopeful for. Politicians reveal corrupt natures on a regular basis, the economy has caused many to lose their homes and savings, evil exists in every city and country, innocent people are being imprisoned for years for their beliefs while pedophiles get off with light sentences. Is it any wonder that so many struggle with depression and suicide rates have increased? Every year, almost one million people die from suicide; this roughly corresponds to one death every 40 seconds. If this world, as it is, was all we had to look forward to it would be easy to understand the lack of “hope” we see in most people. But it isn’t! We have every reason to hope. God has provided a way for a better life in this present world and in the world to come through Jesus His Son! Through salvation, we have direct access to the King of Kings and Lord of Lords. We receive His Holy Spirit to guide us and direct us. Our longing has been fulfilled through Christ! We can now operate out of the love Christ has shed in our hearts and thereby are able to make even this world we live in a much better place while we wait on Heaven! It is so important that we share this “hope” we have received. The same gift we have been given is available to everyone who will call upon the name of Jesus. Without this hope many people will go on to live sad, unfulfilled lives struggling to take them into an eternity that will be even worse. When we share Christ with others we give them the gift of hope, knowing that He will take whatever mess their life has become, and mold it into something wonderful, just as He did with each of us that know Him as Savior and Lord. We are to “overflow with hope” as the word of God tells us in Romans 15:13 NIV 13 May the God of hope fill you with all joy and peace as you trust in Him, so that you may overflow with hope by the power of the Holy Spirit. Why not let your hope overflow into the life of another today? Reach out to someone that needs to see the “hope” we have demonstrated by your being the hands and feet of Christ. Let them hear of the “hope” we have through sharing the salvation message of Christ. As we wait on the blessed hope of Christ’s return, let’s collectively share our present hope with those that need to hear! The book of Titus lays it out so perfectly… Titus 2:11-14 NIV 11 For the grace of God has appeared that offers salvation to all people. 12 It teaches us to say “No” to ungodliness and worldly passions, and to live self-controlled, upright and godly lives in this present age, 13 while we wait for the blessed hope—the appearing of the glory of our great God and Savior, Jesus Christ, 14 who gave himself for us to redeem us from all wickedness and to purify for himself a people that are his very own, eager to do what is good. Lord, today use me to demonstrate the “hope” you offer to others that don’t know you or those that have been sidelined by sin and the cares of this world. Let my actions and words share the truth of who You are and the hope that You offer each and every person that willingly turns to You. ← Are you ALWAYS prepared to give an answer?